Have you noticed how everyone is starting to practice daily meditation? In 2018 the world is awakening to meditation, mindfulness, and other spiritual practices. And we here at THE DAILY MEDITATION have created the ultimate experience for daily meditators. On this site you will find everything you personally need to get started on the healthy, happy, conscious lifestyle. Whether you want to learn Buddhist, Taoist, Hindu or yoga techniques, we’ve got you covered. I bet you love quotes, right? We do too. That’s why we’ve created this stunning gallery of daily meditation quotes for you. 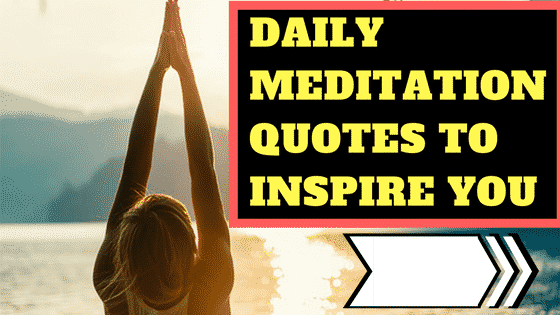 Click the image to view our gallery of daily meditation quotes for inspiration. Includes quotes from The Dalai Lama, Deepak Chopra, Thich Nhat Hanh, The Bible and Buddha. How long should you meditate for each day? For best results we recommend creating a habit of meditating daily for 20 minutes. Decide somewhere you will meditate each day. Stick to the same place at first. Continue every day for one month. Rather do a different meditation technique? Check out our gallery of meditations, below. There are 31 Meditation Techniques that all meditators should know. Most of them are Buddhist meditations. But there are also Hindu and yoga meditation, and some new age meditation techniques too. There are also meditations for atheists. 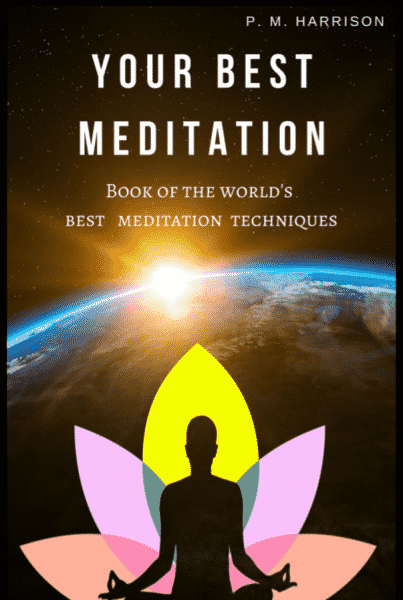 Our new book has meditations from Buddhism, Yoga, Hinduism and non-secular methods too. Take a look. If you want to learn meditation, it is probably best to start doing Buddhist meditation daily. There are very many different Buddhist styles of meditation, and each trains the mind in a specific way. You can read about specific Buddhist meditations via the link above. One of the best Buddhist meditation techniques to look at is Samatha. And another very popular Buddhist meditation technique is Vipassana. Loving Kindness meditation (Metta)is used for creating happiness and warm feelings of love and kindness. A Buddhist meditation technique, loving kindness is one off the most important meditations in the world. The benefits of meditating daily in the Metta style inclue happiness, compassion and love. It is quite an easy meditation for beginners. Mindfulness meditation is the most popular meditation technique in the world. It is all about focusing the mind on the present moment. Mindfulness is a Buddhist meditation technique that has become popular in the West. It is good for relaxation, productivity, stress and mental health. It is also very easy to begin. Try practicing this as a daily meditation technique. Chakras are energy centres in the body through which prana / chi flows. By balancing these chakra we achieve many different health benefits. Daily meditation on the chakras will totally redefine your health. One of the main meditations in yoga is Chakra Dhyana, a technique which is used to balance the chakras. Balancing the chakras is good for health and happiness as well as spiritual development. These are methods for advanced meditators. Taoist meditations are all about activating chi flow around the body. These include the likes of Aikido and Tai Chi. There is a famous Lao Tzu quote that expressed Taoist beliefs. It is: When you correct your mind, the rest of your life falls into place. Taoist rituals and practices are about creating healthy minds that in turn create healthy bodies. Transcendental Meditation Technique is a relatively modern meditation that is used by many celebrities, such as Arnold Schwarzenegger, Katy Perry and David Lynch. transcendental Meditation a mantra-based meditation technique with many proven health benefits. Heads-up: it’s also the most expensive meditation in the world to learn. Mantras are sacred words or phrases (similar to spells or affirmations) that we meditate on. By meditating on mantras we can improve health, create happiness, and create many different spiritual health benefits. There are Buddhist, Hindu and Kundalini yoga mantras. There are many different benefits of mantras. Mudras are specific hand and body positions used in Hinduism, yoga and Buddhism. There are over 60 major mudras in use today. This is the cutting edge of mindfulness and psychology. The single best way to change your thoughts and to stop thinking negative thoughts. Mindfulness-based cognitive behavioural therapy is used to stop negative thoughts in order to help with stress, anxiety, depression, and confidence. These methods are good for either advanced meditators or for working with a therapist. If you want to meditate at home it is important to have a good meditation space or meditation room. In this tutorial I share with you my best tips for creating a mindful space to meditate in. If you enjoy DIY and are looking for exercises to do at home, this is perfect for you. Want to become a meditation teacher? Our tutorial shows you how to start teaching meditation. We will show you why you do not need a meditation teacher qualification. You just need to know the facts and the techniques. A Zen Garden (Japanese Rock Garden) is a garden used for meditation. When we create a Zen garden we meditate on the gardening. And when we are finished, we have a beautiful outdoor or indoor garden to meditate in. For Zen Buddhists, gardens are a must. This tutorial shows you how to DIY or buy a Zen garden. Daily Meditation Challenge: We challenge you to do one of these meditations every day for 30 days. There are more than 100 benefits of meditation. Daily meditation effects all areas of life. However, it is worth bearing in mind that there are also health risks of Meditation. There are so many benefits of daily meditation for dieters. Mindfulness and meditation help with weight loss. There are many excellent meditations for weight loss, including mindful eating, mindful cooking, and meditation to stop cravings. With mindfulness, weight loss becomes easy because we are more conscious of what we are eating. Do you struggle to sleep at night? Are you easily disturbed when you sleep? Looking for a cure for insomnia? Why not use meditation for sleep, this article show you how. Includes Buddhist and yoga techniques as well as mantras and mudras. Are you looking to increase the intimacy in your relationship? Maybe you want a happy married life. Or perhaps you are worried about divorce and want to avoid divorce. Meditation can help. This article shows you everything you need to know about using meditation in relationships. Want to be more beautiful than you already are? Want soft smooth skin, flowing long hair, healthy nails, or a beautiful smile? Science has shown that meditation makes you more attractive. There are mudras and mantras for beauty too. This article shows how to use meditation to be beautiful, youthful and attractive. Meditation malas are a string of beads that are used to count breath, mantra recitations, or japa (recitations of Buddha’s name). These spiritual necklaces and bracelets are some of the most important products for meditators, Buddhists especially. This buying guide show you how to DIY a mala and how to buy a mala online. When it comes to daily meditation, apps can help you to get in the habit and stick to it. From Headspace to Calm to Insight, there are many excellent meditation apps (free and paid) out today. Available on Android and iOS, there are lots of subscription-based and free apps for meditating daily. They are excellent ways to train the mind to be stronger. Some are guided meditation apps, others are designed to teach proper meditation techniques. Take a look at the link above for more on this. Want spiritual inspiration and encouragement? See our choices of the best spiritual blogs. Includes Buddhist, yoga, Hindu, not-secular, and new age blogs. The best meditation chairs, seats, and benches, help you to sit with good posture and help you to focus when meditating. In this buying guide we help you choose the best meditation chairs, seats, and benches for your practice. This will help improve your focus and preent spinal injuries and other problems when meditating. All practicing meditators should have a good meditation cushion, pillow, meditation seat or an alternative (yoga bolster, Zafu, Zabuton). This buying guide shows how to choose the best cushion for your home or sacred space. Tibetan Singing Bowls produce sounds you can meditate on to open chakras and heal your mind and body. They are used in yoga and Buddhism. And even if you don’t want to learn how to play a Tibetan Singing Bowl yourself, you can still listen to Tibetan Singing Bowl music to meditate on. in this guide I’ll share absolutely everything you need to know, including the history of Tibetan singing bowls, a buying guide, and a tutorial on how to use singing bowls. Meditation tools are much more than material objects. They are assets and allies in our quest for inner peace. Having the right meditation tools in your home can make all the difference to your health, happiness, and spiritual development. In this article I share with you my top 10 tools for meditators. Meditation music is some of the most powerful music in the world. Why? Because it’s been scientifically proven that meditation music promotes inner peace, calmness, love, and positive emotions. We all know nothing beats going to your meditation room, closing your eyes, and listening to relaxing music. This guide includes Chinese, Buddhist, Kundalini Yoga, and modern meditation music. If you want to read the best spiritual books, take a look at the link above. In it I share with you all the best spiritual books on meditation, mantra, mudras, yoga and, well basically everything else to do with spirituality. There are many excellent ways to use meditation for depression. Mindfulness and similar methods help train the mind to stop painful emotions. There are yoga, Hindu, Taoist and Buddhist meditations for depression to use daily. Remember the Buddha quote: “If you are depressed you are living in the past. If you are anxious you are living in the future. If you are at peace you are living in the moment”. This quite teaches how to live in the moment and stop negative thoughts so you naturally beat depression for good. There are many excellent daily meditations for anxiety. Mindfulness, Zen, chakra balancing and breathing techniques are a good place to start. In this guide I share with you the yoga and Buddhist methods for beating anxiety naturally without medication. Stop feeling anxious and depressed and find happiness and inner peace with this tutorial. The most common mental health problem in the world is stress. Mindfulness stops stressful thoughts and relaxes the mind so we have inner peace and relaxation. There are many good meditations for stress: Buddhist, yoga, and Hindu techniques, as well as new age options too. These help us stop stress naturally and stop negative thoughts that make us feel anxious and unhappy. In this tutorial I show you how. The subconscious mind is the most powerful part of the mind. It is from the subconscious that our beliefs are born. And it is the subconscious mind that controls our lives. In this tutorial I reveal how to control the subconscious so you can be successful in life. You want to read something personal? Read the link above. It will show you how to quit all addictions in one go. It’s pretty shocking, actually. Which 1 Of 28 Yoga Styles Should You Do? Which type of yoga should you do? Ashtanga? Vinyasa? Hatha? Iyanga? Bikram? There are many different types from. In this article I share the best types of yoga for beginners to learn. Click through to the next page for The Daily Meditation blog. The Daily Meditation is based in the Rosedale area of Hamilton, Ontario, Canada near Gauge Park. We’re proud to belong to the community that also includes our spiritual friends, such as Samudra Kadampa Buddhist Centre, Shambhala Hamilton, and Sirmingala, as well as De La Sol Yoga, Aviva Yoga, and In Fine Feather. We’re proud to be a meditation teacher in Hamilton Ontario. Nothing makes us happier than sitting on the escarpment meditating over “The Hammer.